From my childhood, I grew up with nature all around me. My father was working as a teacher. But farming was one of his interests. Now, even after getting retired from his teaching job, he was looking after his farm, cultivating many species of pulses and vegetables. Those days, as a kid I used to accompany him and pick vegetables on my way back home. My every visit to farm, I used to see many greens including balloon vine and pirandai. I remember playing with balloon vine plant and its fruits (known as mudakathan keerai in tamil). My sister and myself used to play by hitting the fruit of this plant on each other's head. Those memories are still fresh. But somehow I forgot and I didn't realize the health benefits of 'Pirandai' until I grew up. 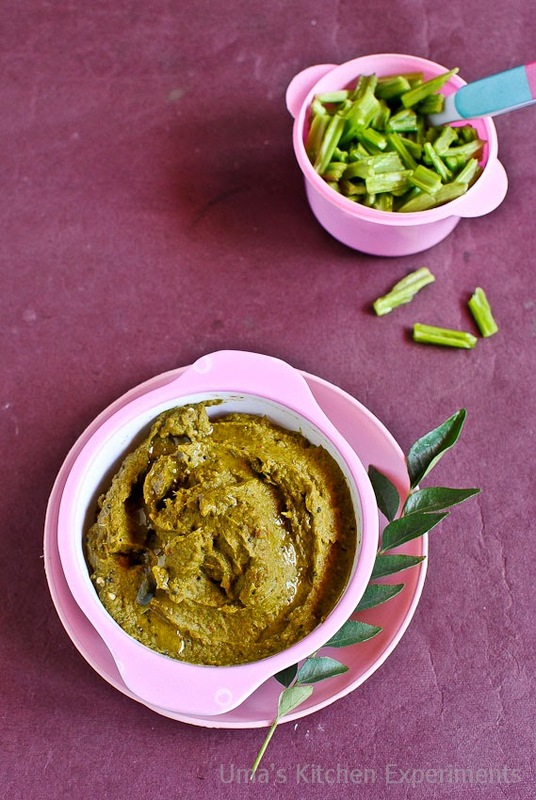 Pirandai is a type of creeper plant on which this recipe is based on. Many of us wouldn't have heard of this name 'Pirandai' or know its importance. 'Pirandai' had an unique structure. It looked like a green snake when gazed from a distance. 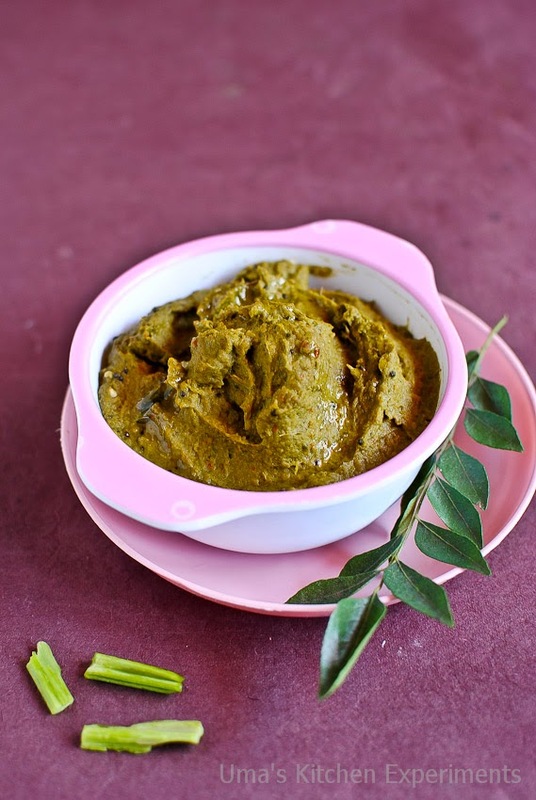 After knowing its health benefits, I wanted my mom to make this thogayal/thuvaiyal/ chutney or gravy (both of which she usually does). Last time when I was away, my mom got tender pirandai. She called me over phone and asked me whether she can send it across via courier. :-) Since I didn't know how to clean it, I didn't show great interest. During my last visit I made up my mind to cook Pirandai, so got sufficient quantity of it. My mom showed me how to clean and cook the dish. I tried the same and now I present it in my blog for you. It took 2 hours for me to clean half a kilogram of pirandai. The cleaning part is little difficult and you need to remove the four corners of the tender pirandai and the skin of matured one's to remove any unnecessary fibre(naar in tamil) from it. Pirandai - 2 cups, cleaned, chopped into 1 inch pieces. 1) Clean the Pirandai. Remove the fibre from its four corners using a sharp knife. Remove the links or joints. Pluck the leaves alone and collect it in a separate plate. 2) Please refer the below pics to know how a cleaned Pirandai and its leaves look like. 3) Wash both the Pirandai and its leaves using water and drain the water completely. 4) Heat a pan and add 2 teaspoons of oil to it. Add Pirandai and saute till the Pirandai changes its colour and shrinks in its size. Transfer it to a plate. 5) Now, add its leaves and saute till it shrinks well. Transfer to a plate. 6) Now add the remaining oil. Roast red chill and urad dal. Once the urad dal turns nice brown colour and releases nice aroma, turn the stove off and transfer the roasted ingredients to a plate. Allow them to cool to room temperature. 7) In mixie jar, add all the sauteed ingredients, with tamarind. Add salt. 8) Grind it to a smooth paste by adding enough water. It takes 5-7 minutes. 9) Heat oil which is given under for seasoning. 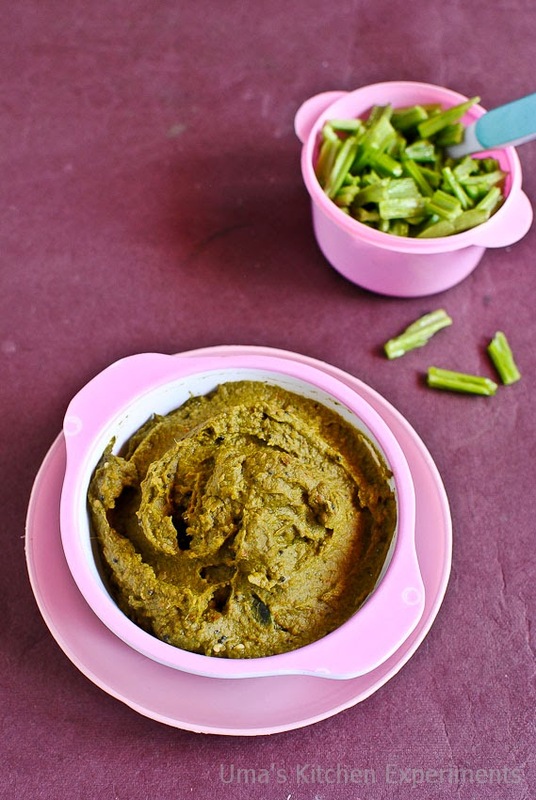 10) Add mustard seeds, curry leaves and asafoetida. 11) When the mustard seeds starts spluttering, add ground paste. Use 1/2 cup of water to rinse the jar and add it to the same pan. Mix well. 12) Let it cook for sometime or till the paste changes its colour. 13) Once done, allow it to cool and store it in a box and enjoy it with hot steamed rice as a side dish or as a chutney for idly and dosa. 1) Apply Gingelly oil to both of your hands or wear gloves before cleaning the pirandai. 2) My grandma prepares the same thogayal using pirandai, urad dal, dry red chilli, tamarind, ginger, garlic and grated coconut which gives another variation. 3) Buy Pirandais that looks tender and bright green in colour. Usually the tender ones are very easy to clean. 4) The Dry red chillies what I used tasted very very spicy. So, I added only 4. Generally for 2 cups of pirandai, add 8-10 dry red chillies or adjust according to its spice level. 5) Add more oil if preferred. U r very lucky Uma, wish i get this much fresh pirandai, even it take half a day to clean for me, am ready to cook with this fabulous pirandai.. Chutney looks irresistible, its in to do list since ages u know. 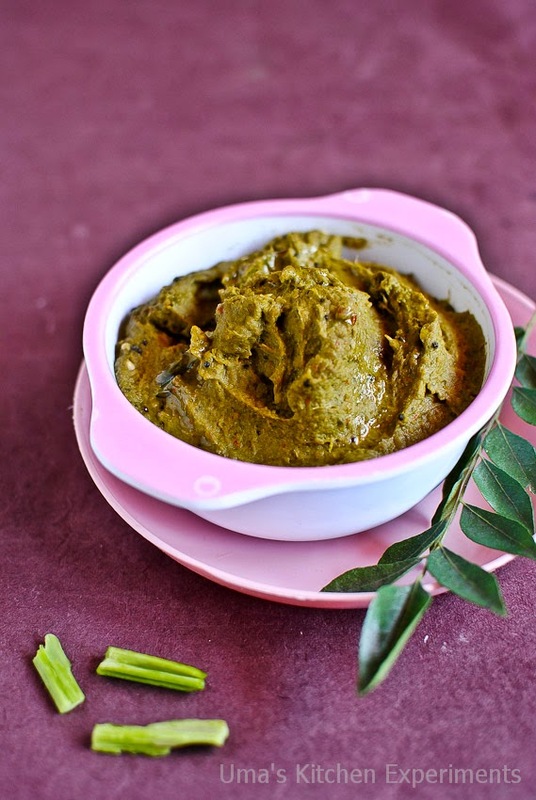 nice healthy chutney.. Looks yumm..
Wow you have taken efforts to present us such a healthy recipe...Thank you dear. You are on a chutney posting spree :) Though I have heard a lot about pirandai..never got a chance to try it. The cleaning job sure sounds like a herculean task..but the end result - the thogayal looks tasty and its very healthy too. wonderful recipe uma.. i had these creeper but lost it.. i shd try getting it bk.. If the pirandai is freshly picked and tender one, itching would be less. Don't keep the prindai for long days in fridge which may increase the itching. Make sure to apply oil before cleaning. It doesn't cause itching while eating if you have used the tender and fresh pirandai.